Some of the government’s most powerful edifices – the U.S. Capitol, the Supreme Court and the U.S. House and Senate – make their homes on this famed incline, where Instagram-ready views of the Capitol Dome come at almost every turn. Capitol Hill is one of the city’s most popular places to live, with 19th-century rowhouses and a market plus a vibrant nightlife and dining scene. Politicos, young staffers and tourists alike head to the neighborhood both for its government buildings like the U.S. Capitol and the Supreme Court and the surrounding historic, walkable, restaurant-filled blocks. Tour the U.S. Capitol via its impressive visitors center, where guides lead small groups under the intricately painted, 180-plus-foot dome and past the dimly lit Old Supreme Court Chamber. You’ll need a reservation for the tour or to visit Congress or the Senate (when they are in session); for the latter, just contact your senator or house representative. Nearby, the Library of Congress' impressive 1897 Thomas Jefferson building is open for tours that reveal its Italian-Renaissance style architecture and gilt murals, plus the stunning, circular main reading room with its 160-foot-high ceiling. Other attractions include the Folger Shakespeare Library (the world’s largest collection of the author's timeless works), and the glassed-in U.S. Botanic Garden at the base of Capitol Hill, which holds palms, ferns and orchids and provides a peaceful escape. Nineteenth and early 20th-century rowhouses (think turrets, stained glass and ironwork) lead to throwback commercial zones. Eastern Market, an 1873 brick building houses grocers, bakers and pasta makers inside every day except Monday, as well as a lively weekend bazaar with produce, crafts and antiques. The nearby micro-neighborhood of Barracks Row centers on 8th Street SE, where vintage storefronts hold oyster houses, pubby bars and foodie-focused restaurants. Closer to the Capitol, Massachusetts Avenue NE has multiple restaurants and longtime watering holes. Perusing farm-fresh produce and handmade crafts at Eastern Market, hunting for old novels at Capitol Hill Books, foodie-focused restaurants and cafes on Barracks Row. We recommend you ride the Metro to the Capitol South, Union Station or Eastern Market stops to explore Capitol Hill. 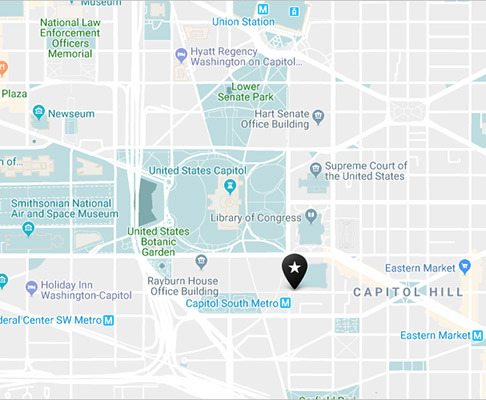 Multiple Capital Bikeshare stations can also be found in the area, and east of the U.S. Capitol, the blocks are relatively short and flat, making walking or cycling a breeze. Welcome to Capitol Hill. This is where laws get passed, photos get taken and things move a little bit faster. Get up to speed with the latest happenings in the nation’s busiest neighborhood.